Are you thinking about buying a boat but are not sure about what you need to consider? Here’s some information that can help you find the right boat for your needs. Boats are an escape for some people, and they’re a tool for work for others. There are plenty of reasons to own a boat. Your boat should suit your preferred activity. Whether you’re new to the world or boat ownership, or if you need some help in deciding which ship to choose, this article Ken Reaser Enterprises has prepared for you will help you out. What’s Your Boat’s Main Purpose? The first thing you need to consider, after setting your budget is what your boat’s purpose will be. Will it be used just for fishing or will you be entertaining guests? Do you plan to stay overnight? Are you considering trying watersports? All the different purposes will lead you to different boat options. A used boat is much cheaper than a brand new boat. If this is your first vessel, it’s a better idea to get a new one so you can gain some insight on market prices and which types of boats best suit you, in case you’re thinking about getting another one later on. If you do go for a used one, do your research. Even better, get the boat looked at by a professional to determine its condition and value. Check the National Association of Marine Surveyors list of professionals. What kind of performance do you expect from your boat? The weight and horsepower have a direct impact on its performance. If the motor isn’t powerful enough for what you want, you’ll never get the expected results. If you want an easy to maintain and lighter engine, you should go for a two-stroke. Remember that 2-strokes need a mix of oil and fuel for lubrication, just like AMSOIL’s Outboard 100:1 Pre-Mix Synthetic 2-Stroke Oil. Four-strokes, on the other hand, are heavier, and their maintenance needs are more demanding than 2-strokes, but they last longer and they also help reduce water pollution. Perhaps you prefer something simpler like a paddleboat or a sailboat. Bear in mind that even sailboats use a small engine and require synthetic oil changes. Whichever engine you choose, AMSOIL Synthetic Oil has everything you need to cover your marine oil needs. Explore their marine line at their online store. You can also call Ken Reaser Entreprises at (321) 230-6958 to get some marine oil recommendations and make your purchase in Apopka. How big do you want your boat to be? You will need to get a big boat if you plan on entertaining friends and family. If it’s just you, a friend, and the fish a smaller boat will do. Be realistic about your needs, so you don’t end up getting something larger or smaller than necessary. You want to be able to use your boat regularly. Also, depending on your boat’s size, you might need to get some permits. You need to consider where you’re going to store your boat before you commit to making the purchase. It probably won’t fit in your garage along with your car. Even if your ship does fit, you need to think about how you’re going to tow it to the water. Can your vehicle handle that weight? Consult your owner’s manual to know what the max weight your car can haul is. When you’re calculating your boat’s weight, you need to include all the extra weight of the elements you need to make it safer. 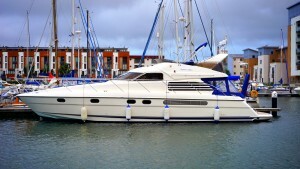 You can also look into long-term storage or keeping in moored and consider those elements in your ongoing boat costs. After you finally decide on a boat, you’re going to face another big challenge: naming it. You wouldn’t want to end up with a sucky name for your dear boat, right? Sailfeed has some tips to help you find the perfect name for your vessel. After you’ve purchased your boat, you will want to care for it to make it last longer. As a part of the regular maintenance it will need, you will need to get synthetic oil changes. The best thing you can do for your vessel is use high-quality marine lubricants like the ones you can find at AMSOIL. For your four-stroke engine, their 10W-30 Synthetic Marine Engine Oil will do just fine. You can explore and purchase AMSOIL’s marine oil line online, or you can call Ken Reaser Enterprises at (321) 230-6958 to learn more about AMSOIL Synthetic Oil and which marine oil is best for your engine.